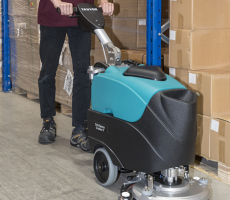 Staffordshire County Council first bought the Truvox Multiwash multi-purpose floor-cleaning machine back in 2000, as more and more safety floors were installed in Staffordshire schools. Since then, Staffordshire has continued to buy the Multiwash and, more than ten years on, has now bought over 250 of them. Chris Ryan, Group Manager (Development) of Cleaning Services for Staffordshire County Council, explained that it was primarily the simplicity of using the Truvox Multiwash on notoriously labour-intensive safety flooring that prompted the initial purchase, and the effectiveness and reliability of the Multiwash that encouraged them as a local authority service provider to buy more. 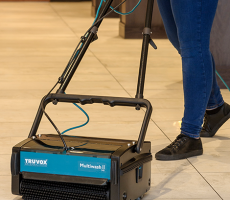 High-speed productivity - The Truvox Multiwash washes, mops, scrubs and dries on both hard and soft floor coverings in a single pass and leaves floors ready to walk on in minutes – an essential capability for health and safety compliance. It is extremely effective on ‘difficult’ floors like non-slip safety floors, low pile carpets, entrance matting and escalators. Easy to use and manoeuvre, the Multiwash has quickly interchangeable brushes, with a range of different brushes available, and easily accessible and removable tanks to make filling, emptying and cleaning straightforward. Proven over more than a decade for cleaning food service areas, hospitals, schools, nursing homes and retail stores, the Multiwash is available in three different cleaning widths – 24 cm, 34 cm and 44 cm. The larger models are available with a pump and spray if required, making them better for cleaning carpets or larger floor areas.